If you're experiencing clutch slippage with your old Sportster, and you've already tried lubing and adjusting the cable, it's time to remove the primary cover and see what's going on. Slippage can be caused by worn friction discs or weak spring tension. If your clutch is dragging or not releasing, the clutch discs may be gummed up or warped. Ironhead clutch removal does require a few specialty tools. Early Sportsters (1970 and earlier) have a dry-clutch setup, and therefore have different procedures. The following article covers 1971 and later Ironheads with the wet-clutch. 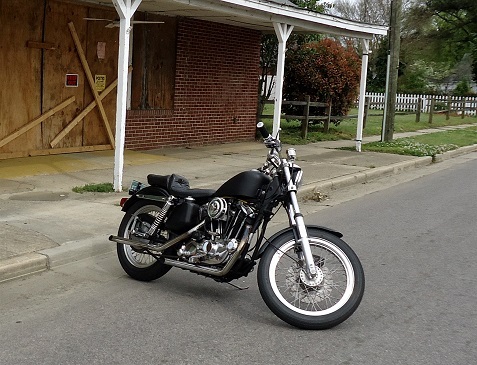 The motorcycle in the pictures is a 1976 XLH Sportster. Stabilize the bike in an upright position. If you don't have a motorcycle work stand, put the front wheel into a chock or clamp so the bike is vertical. Another way is place a piece of wood under the kickstand so the bike sits more upright (careful it doesn't fall over the other way). If you have an electric-start bike, disconnect the battery. You may have to remove the battery and its tray to remove the primary cover. Remove left foot peg and foot lever. Place a drain pan under the motorcycle. Remove the oil level plug and drain the primary oil. 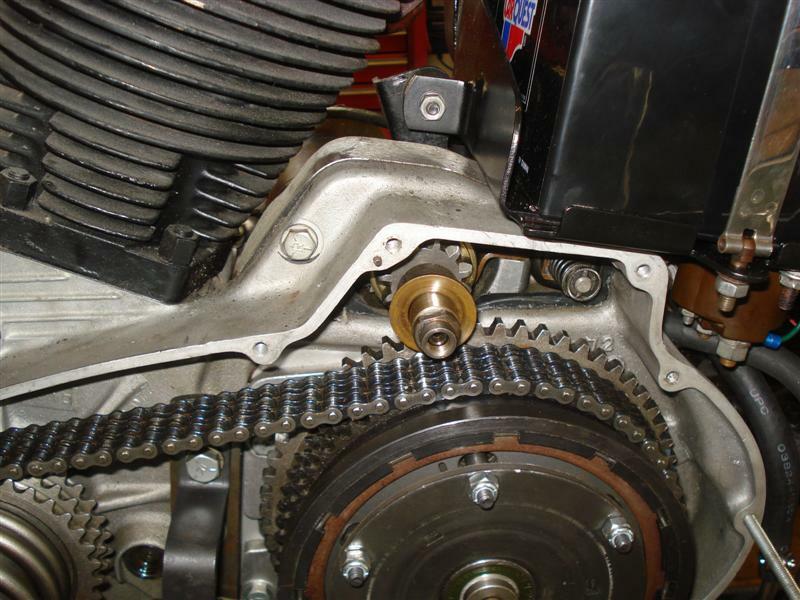 Remove the primary chain cover and gasket. Note that some of the Allen bolts are longer than the others, and one of the bolts is thinner. I put holes in the shape of the cover in a piece of cardboard to keep them in order. To remove the nuts (and retainers on 71-74 Sportsters), a clutch spring compressing tool is needed to take pressure off the clutch assembly. You can either buy one, borrow one, or make one. This tool can be easily made out of a piece of metal stock and some 1/4-20" threaded rod (same thread as primary cover bolts). All that's needed are two pieces of threaded rod, about 8" long each, and a couple of 1/4" nuts and washers. I drilled and tapped a hole in the center of the metal stock, then drilled holes in either end. Thread the two pieces of 1/4-20" rod into two primary cover bolt holes. Put nuts and washers on the rods and tighten them. Tightening the center bolt compresses the clutch and allows you to remove the nylock nuts holding the clutch in. 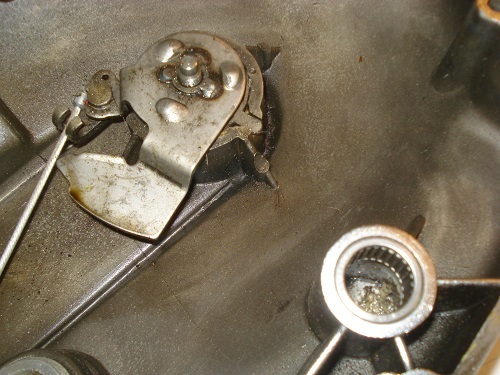 Keep the tool tight against the clutch plate, and don't loosen it until all the nuts are removed. If you back it off and still have the nuts on, you will bend the studs. After you have removed the six nylock nuts, slowly back off the two nuts holding the tool to the primary cover. With a flat-blade screwdriver, remove the large retaining ring from its groove in the clutch shell. The first clutch piece to come out is the outer drive plate. Remove the friction plates, steel plates, and spacers from the clutch hub. In your Harley-Davidson service manual, the eight friction plates with the teeth are called drive plates, and the eight steel ones are called driven plates. The metal ring with the six studs inside the clutch shell is called the pressure plate, or clutch backing plate. It is removed by holding the studs and pulling it out. Once the clutch plates are out, inspect each one of them. The friction plates come with oil grooves in them. If the grooves are gone, replace the plates. Also check for burns or scores, indicating they have been overheated. Check for warped steel plates. A little blueing is OK. If the plates are rusty, pitted, or grooved, buy new ones. 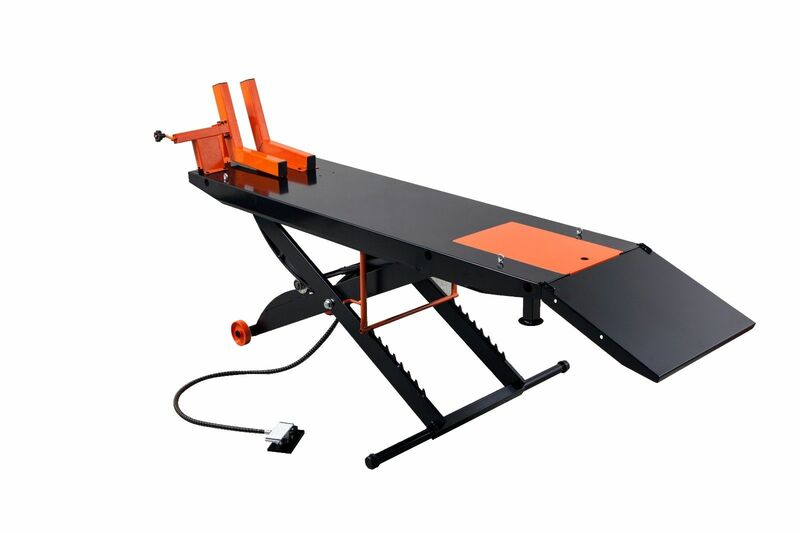 Clean all parts before reassembly - wipe the steel plates, do not use cleaners. Install the pressure plate back in the clutch basket with the studs sticking out. There should be six spacer tubes, one for each stud. These make the correct plate adjustment and also line up the pressure plate. Install spacers on the studs. NOTE: On early Ironhead motors, spacers need to be measured, then aligned. Install a friction plate, then a steel plate over the studs. Alternate steel plates and friction plates until eight of each are installed. This should leave a steel plate on the outside. 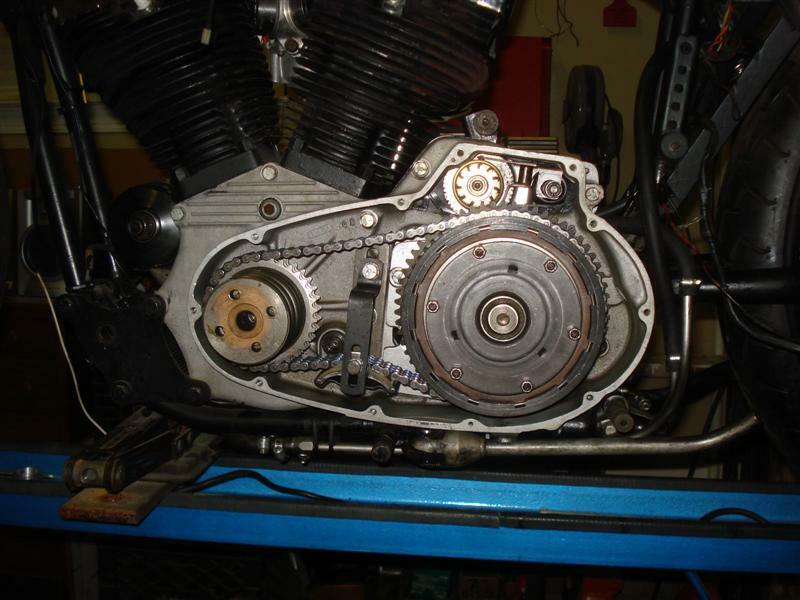 Once all 16 clutch plates are in place, the outer drive plate goes back on. 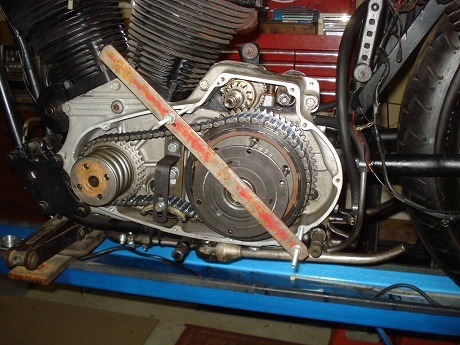 Set up your clutch compressing tool and slowly tighten both ends evenly. Tighten the tool until you can thread the nylock nuts (1/4"-20) on at least three of the six studs. Tighten these nuts on the studs until the others show enough threads to be started. Tighten all six nuts evenly. Do not re-use the old nuts - buy new ones. Before installing the primary cover, inspect the inside of it. Make sure that none of the three ball bearings in the clutch cable release mechanism are missing or distorted. A ball out of round will cause binding, and the clutch will fail to function properly. An upgrade to consider on later Ironheads is replacing the original "ball and ramp" set-up with a hydraulic clutch. This would eliminate the clutch cable and provide smoother shifting (and also finding neutral). 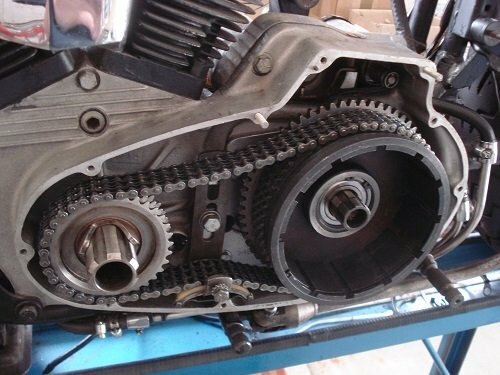 Unfortunately, I do not know of a reputable supplier that offers a hydraulic clutch for pre-Evo Sportsters. Install primary cover with new gasket. Some owners use double gaskets to help prevent leaking. Re-install rear foot brake lever and foot peg (also battery and tray if removed). The last step in Ironhead clutch replacement is refilling with oil. Use either the Harley-Davidson product or the same oil as you put in the motor. Remove the oil filler plug and oil level plug. Add oil through the top plug until it starts coming out the bottom plug. Replace both plugs. To adjust the clutch, unscrew the large assess plug. (using the side of a wrench works well). Loosen the locknut. With a flat-blade screwdriver take up the free-play on the adjusting screw, then back off a 1/4 to 1/2 turn. Basically you are turning it in until you feel pressure, then backing it out some. The backing off is to make sure the clutch is fully engaged. Tighten the locknut without moving the adjusting screw. Make sure there is an o-ring on the back of the assess plug before re-installing (to prevent a possible oil leak).